We are developing new concept of sailing ship model kits. 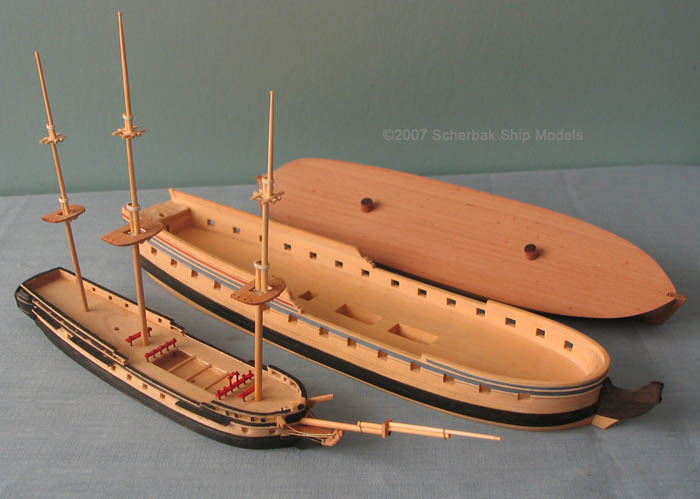 As never before, you can assemble sailing ship models from deeply researched and expertly designed wooden kits that we made in small uniform scale 1:200. We were always fascinated by antique small size and somewhat disproportional Prisoner of War or Sailor’s made ship models with their hulls boldly built from solid pieces of wood or bone, tiny parts smartly and often intricately carved and rigging thoroughly imitating original. They are a great inspiration for building our models in similar manner, but carefully scaled to exact ship’s architecture and proportions and made from the best materials available, often hard to find and hard to work with, but beautifully colored by nature or technology so only minimal paint should be used during model finishing. Models we make in this style are expensive. So we developed these affordable “Build from Scratch” ship models kits for modelers who share our love to small size naturally colored miniatures and have basic modeling skills. Our kits will save you tremendous time and resources on historical research, finding the best possible building materials and graphical preparations. At the same time they will stimulate your very own individual approach and skills in model creation. Our kits are very different from others on the market. No cheap and soft balsa or basswood, no easy to break birch dowels for masts and spars, no disappointment when you compare expencive kit you purchased with true historical materials and plans. Our materials are highest grade money can buy - carefully selected hardwoods for hull construction and hard to find beautiful exotic woods for small parts. Our masts are strong and flexible bamboo and yards are even stronger and more flexible black carbon fiber, so your model can be directly handled and even played with! We include original historical plan as a reference! We encourage you to check with original sources and even modify our kit to your liking, vision and understanding. "Build from Scratch" approach means you will do your own parts and construction using included materials, templates and instructions. Our instructions are only general, - we do not want to write a whole book for each kit, assuming model makers have published books, know the subject and how to use tools and glue. Model kits will be designed from the best plans and other resources available. Separation of hulls along waterline, scale and size of our models (not too big, not too small) will allow using them not only as attractive displays and collectables, but also for wargaming. 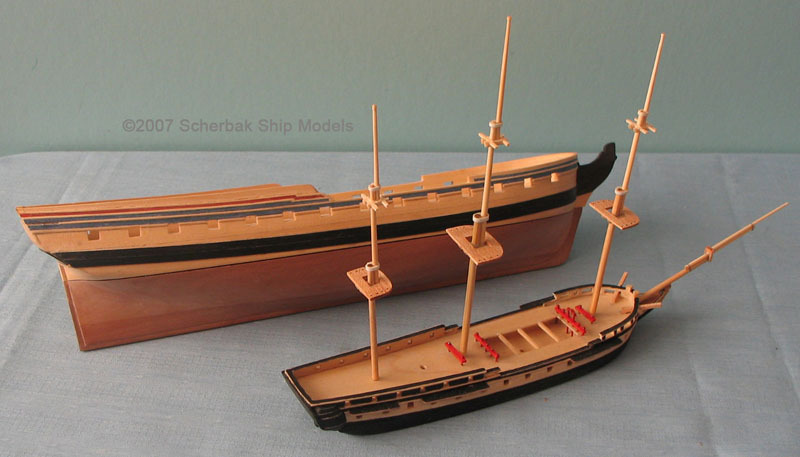 Scherbak Ship Models has long tradition (2 generations) of creating expensive, museum level models of sailing ships in wood, so you can be sure that our new line of model kits for modelmakers and collectors will be made with deep knowledge in this complex field.